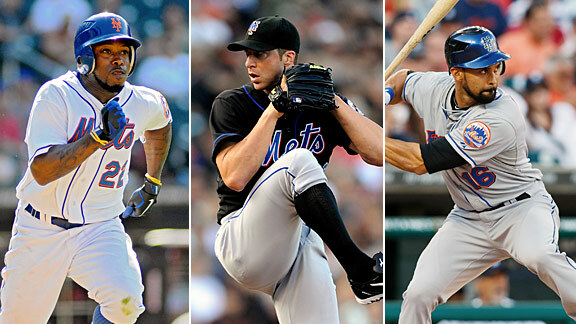 A source told ESPNNewYork.com that (l to r) Willie Harris, Chris Capuano and Angel Pagan are among the Mets who have cleared waivers. Jason Bay, Chris Capuano, D.J. Carrasco, Willie Harris and Angel Pagan have cleared waivers, a source told ESPNNewYork.com. That does not mean any of the players will get traded. It merely mean they are eligible to be traded to any of the other 29 teams this month. Bay is only in the second season of a four-year, $66 million deal, so going unclaimed makes sense. If a team would have put in a claim, the Mets could just have unloaded Bay's contract on the other team by letting the claim go through. Similarly, but with far less money at stake, Carrasco is in the first season of a two-year, $2.4 million deal.